The price of platinum lost more than $20 an ounce and sister metal palladium also eased on Thursday after two of the world's top producers made a fresh offer to workers who have been on strike for 12 weeks. On the Comex division of the New York Mercantile Exchange, platinum futures for July delivery – the most active contract – in afternoon trade exchanged hands for $1,419.70 an ounce, down $18 compared to yesterday's close and near the day's lows. On the day before more than 70,000 South African workers went on strike at Anglo American Platinum (LON:AAL), Imapala Platinumm (OTCMKTS:IMPUY) and Lonmin (LON:LMI) which together account for almost 50% of the world's production, platinum was trading at $1,450 an ounce. Number one producer Amplats and Implats, the second-biggest, said in separate statements on Thursday they had upped a previous offer of 9% to annual increases of 7.5% to 10%. Reuters reports the new wage hike would push the basic salary of all underground workers to R12,500 ($1,100) a month by 2017. 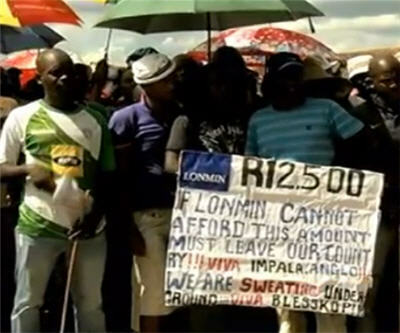 The union has been calling for an immediate doubling of the minimum wage to R12,500, guaranteed for three years. The three mining companies have so far lost a combined R13.5 billion ($1.3 billion) in revenue, while lost employee earnings come to R6 billion ($570m). Roughly 10,000 ounces of production are lost each day the strike drags on and even after a resolution to the bitter dispute can be found it would take months for the affected mines to return to capacity. Year to date platinum is up just over 3%, but remains below where it was this time last year. Palladium also eased back on Tuesday with June futures slipping back below $800 an ounce, down 0.5% on the day. The metal, often used as substitute for platinum in catalytic converters, is up 10% year to date.